In Victoria, Tim and Karen headed back to Seattle and my friend Craig moved on board to accompany me through the Canadian Gulf Islands. He joined me in China on my last trip and is an avid sailor. We spent the evening in Victoria then headed out fairly early the next morning. 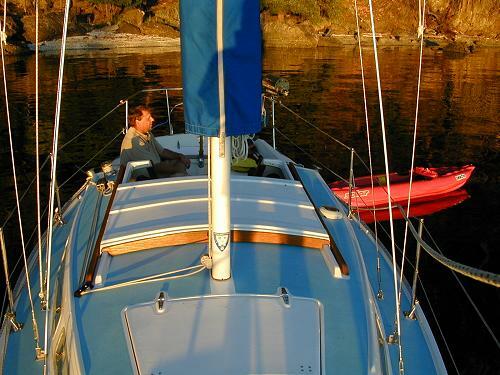 It was a long sail that first day - 36 miles - but we only turned the motor on to leave Victoria and get through the currents in Oak Bay. Craig was determined to ride every little puff of wind. Our stop that first evening was Sidney Spit on the southern end of the Gulf Islands. This is a shot from the beach looking out toward the anchorage. Gata Luna is on the far right. While we were there, the water in the southern Gulf Islands was a beautiful blue color and in many places you could see quite far down. Fortunately we had sterling weather as well - warm days with sun, and cool nights full of dew and stars. 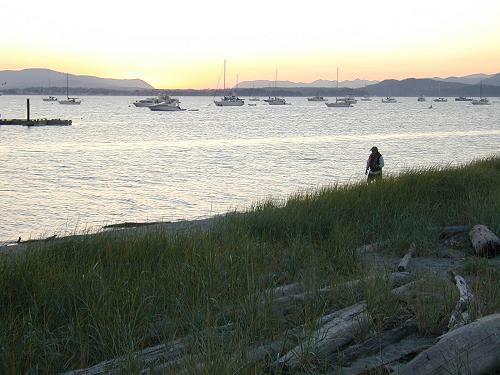 Our next stop after provisioning in Sidney was Portland Island Marine Park. We stayed in the south cove called Princess Cove. 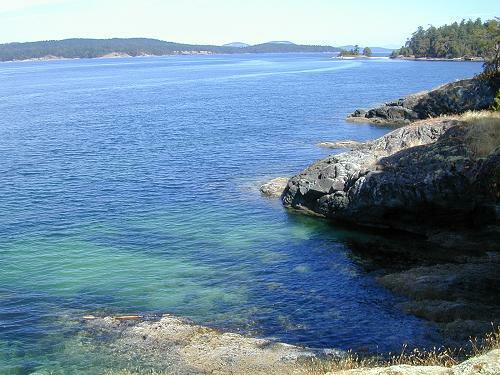 The entire island is a park and is full of hidden coves and beautiful white shell beaches. It took us about two hours to hike around it. It looks like the anchorage is exposed to the south but it was quite protected by the rocks you see in the background. Gata Luna is the third boat from the right. On board I have two inflatable kayaks. 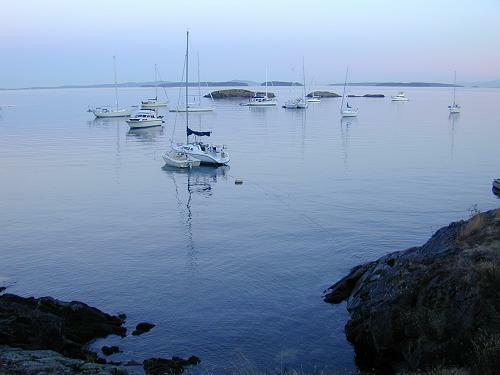 They are great for getting to shore or just messing around the bay after the boat is anchored. 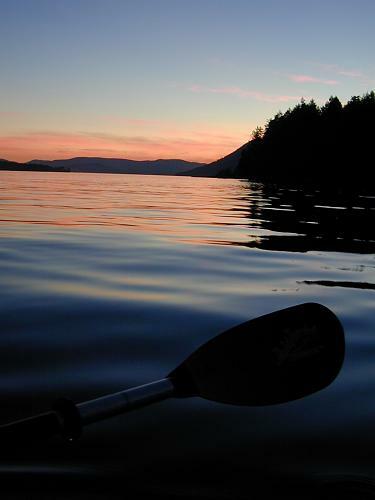 After dinner one night we took the kayaks out to enjoy the sunset. Here is a shot I carefully took while listening to the kingfishers. I have two anchors aboard Gata Luna - a Bruce and a Danforth. The Danforth is best in sand while the Bruce is good in rock and mixed bottoms. I usually use the Bruce since it is the easiest to get to and supposedly requires less scope (the amount of line you let out) to set properly. It took me a while before I could feel comfortable falling asleep at anchor. It's a bit unnerving at first knowing the only thing keeping me and my boat off the rocks is a piece of metal, some chain, and some line. I still spend quite a bit of time making sure my anchor is fully set before I bed down for the night. Our schedule was pretty loose. 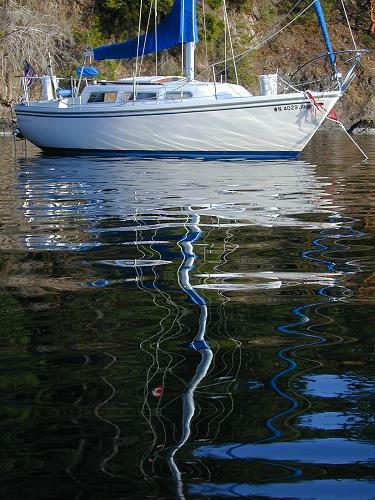 We would usually awake around 7:30 or 8:00, make breakfast and read through my charts and cruising guides. We would also check the tides and currents and listen to the weather report on the VHF. Normally we would be under way by 10 or 11. 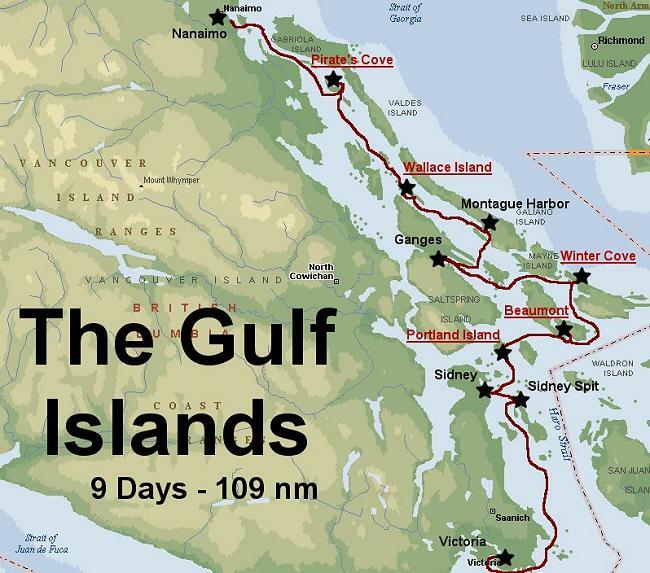 Our stops in the Gulf Islands were not that far apart so we could afford to be slow getting started. Generally we were at our next destination and anchored by 5pm - just in time for happy hour. 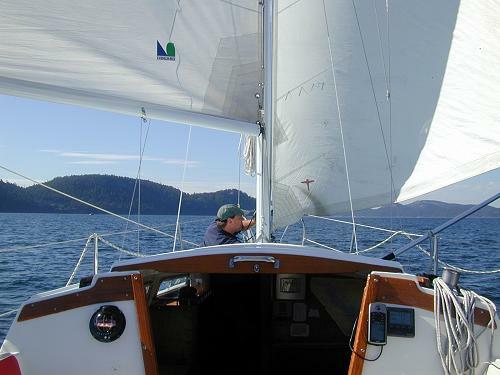 Here is a photo of us cruising up Plumper Sound toward Winter Cove. We were flying wing-on-wing with Otto (the autopilot) manning the tiller and Craig and I snapping photos and enjoying the day. 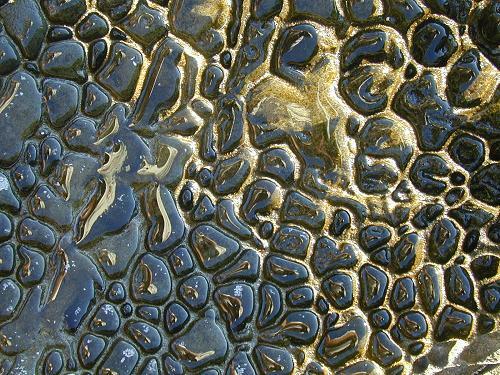 This is a photo of an unusual rock formation. When the tide goes out it leaves tiny pools of water. Each one contained a reflection of me like a fly's eye. I took this at Winter Cove on the Strait of Georgia. 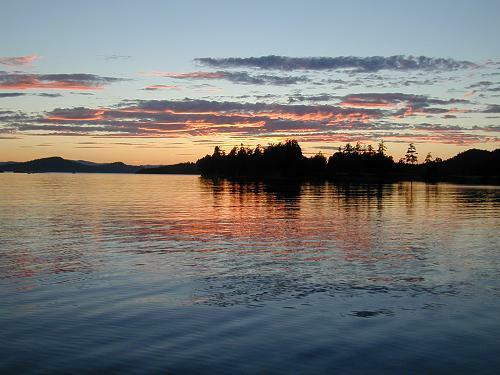 Here is the classic sunset shot taken from the cockpit of Gata Luna at anchor in Winter Cove on Saturna Island.